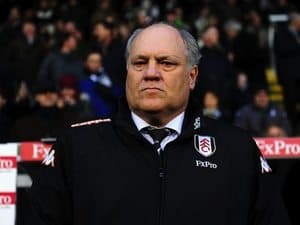 Fulham is overpriced to beat Swansea in what is a must-win English Premier League game for Martin Jol if he wants to keep his job as Cottagers manager until after Christmas. Eleven rounds into the English Premier League season and Fulham’s place among the elite is in the most jeopardy it has been since the Cottagers rejoined the top flight in 2001, hence why Jol is under such intense pressure. Fulham has based its English Premier League survival around its home form for many seasons and its numbers stack up with all bar the division’s heavyweights. For example, Fulham has won 52 per cent of its English Premier League home matches against teams outside the top six since August 2008. One should be shocked to see Swansea quoted as such a warm favourite for an away game versus a Fulham side that won the last meeting of the teams in Wales with three unanswered goals. Swansea is definitely struggling to cope with the demands of juggling both English Premier League and UEFA Europa League football, failing to register a win in any of its last five matches across all competitions. And Swansea’s road results have tailed off badly since the heady days of its 3-0 UEFA Europa League victory over Valencia in Spain. Fulham is a long way from being a football coupon banker but there is no way in the world that the Cottagers should be as long as 3.30, which are the odds that 888sport are offering about a home win, in the circumstances. Fulham hired ex-Manchester United assistant coach Rene Meulensteen during the break for international games. Meulensteen was Alex Ferguson’s lieutenant at Old Trafford for five years and his recruitment can only be a positive for Fulham. Staying in the English Premier League and there is a solid case for backing under two and a half goals in the clash of two of three promoted teams, Hull and Crystal Palace. Hull and Crystal Palace played out a goalless draw in last term’s corresponding English Championship fixture and, with this season’s meeting being a relegation six-pointer, one can expect to be another cagey affair. Hull will have to cope with the considerable pressure that comes with playing at home to Crystal Palace right now, with the world and his wife expecting the Tigers to accrue three points. Hull is not the most free-flowing side at the best of the times and the weight of expectation is unlikely to improve its play in the final third. Crystal Palace has not scored a goal in more than 350 minutes of action and it has hit the back of the net only three times in six away matches across all competitions. Under two and a half goals is available at odds of 1.70 with Ladbrokes and it looks like a great bet. In English League One, Preston is worth backing at odds of 1.65 with BetVictor to beat Colchester at Deepdale. Preston and Colchester are sides heading in opposite directions, with North End mounting a serious promotion challenge and United sliding down the ladder following a start to exceeded expectations. Preston beat Leyton Orient 1-0 in London’s East End last time out and that is as good a form line that one will see in England’s third tier. Colchester travels to Lancashire having lost back-to-back home games and knowing that it has come up winless on each of its last eight road trips. Finally, the Italian Serie A derby match between Verona and Chievo throws up an interesting bet because some bookmakers are quoting Verona at odds against, with BetVictor top of the pile at 2.10. The only logical reason why bookmakers are quoting Verona at odds against is the derby factor because the home team is sixth on the Italian Serie A ladder with 22 points, including 18 out of a possible 18 in front of its own supporters, and Chievo is stuck at the bottom on six points, only one of which it has collected on the road. Derby games between Verona and Chievo have a tendency to produce positive results, with each of the last three and five of the last six being won by the home side. If Verona were playing any team other than Chievo with Chievo’s record then it would be well into red figures. Put aside one’s worries about betting on a derby match and back Verona.